This year's Hatfield House Chamber Music Festival, artistic director Guy Johnston, came to a conclusion on Sunday 28 September at the Old Palace, Hatfield House, with a performance from the festival chamber orchestra. Conducted by Nicholas Daniel they performed Richard Strauss's Metamorphosen and RVW's The Lark Ascending, with Jack Liebeck as the soloist. And then were joined by members of the Hertfordshire Chorus and soloists Ruby Hughes, Claire Barnett Jones, Gwilym Bowen and Tristan Hambleton for Haydn's Nelson Mass (Missa in Angustiis Hoboken XXI no.11). 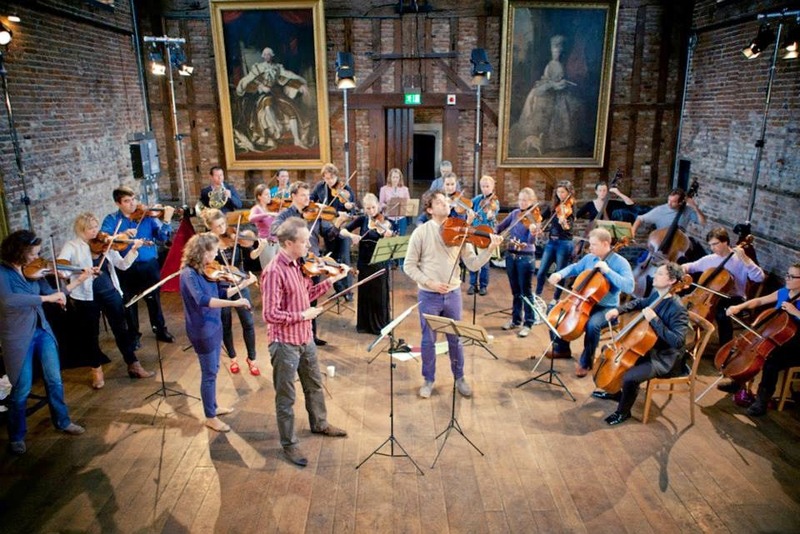 The Hatfield House Festival Chamber Orchestra is made up of the artists from the other concerts in the festival, so that members included the players from the Navarra Quartet, the Aronowitz Ensemble, Hugo Ticciati, Goran Frost and Mark Simpson, along with other friends and guests. Conducted by Nicholas Daniel they opened with Richard Strauss's Metamorphosen, written for 23 solo strings (10 violins, 5 violas, 5 cellos, 3 double basses) in the wake of the destruction in Germany in 1945. Though the work is linked to the bombing of Dresden (where many of Strauss's operas were premiered) he was also much affected by the bombing of Munich were much of the centre was destroyed, including the opera house. Written in 1945 (when Strauss was 81), the piece was premiered in Zurich in 1946. Strauss was present at the dress rehearsal but did not attend the premiere. Metamorphosen is a remarkable piece, full of Straussian lyricism and ache but with a concentrated intensity. With many of the performers having played chamber music together all weekend, their performance of the Strauss has a chamber music feel. Not so much from the sound quality, in fact the strings made a big rich sound, but from the way the performers listened, concentrated and interacted. From the opening, with the warm and complex sound of the violas and basses, it was clear that the orchestra made its own distinctive sound; vibrant but with a clarity to the line and a lovely flexibility. Daniel took the work at quite a gentle tempo, but this was not a relaxed performance, each phrase was highly shaped and taut. Neither was there a feeling of self-indulgence, the relaxing in a warm bath feeling you can sometimes get with Strauss. The beautifully sung lines interacted finely and came together for an orgasmic climax before the poignant conclusion. Jack Liebeck was the soloist in RVW's The Lark Ascending, a work written in 1914 and inspired by a George Meredith poem. Liebeck started on just a thread of sound, developing a sweetly elegant sound with the ornamentation finely and neatly done. This was a poetic rather than a showy performance. At times, Liebeck took risks, playing with hardly any bow and bleached white tone to achieve a quietness, and in fact this was the most daringly quiet conclusion to the work that I have ever heard. The orchestra provided sympathetic accompaniment, and even here there was a real sense of communal intent, of group music-making. After the interval the numbers of performers significantly increased as the orchestra was joined by 50 members from the Hertfordshire Chorus, director David Temple, (the chorus generally numbers 130 or so) and soloists soprano Ruby Hughes, mezzo-soprano Claire Barnett Jones, tenor Gwilym Bowen and bass-baritone Tristan Hambleton. Haydn wrote his Nelson Mass in 1798, one of sequence of masses written each year from 1796 to 1802 for the name day Princess Maria, the wife of his employer Prince Esterhazy. Nelson heard a performance of the work in Vienna in 1800, and it has since then been referred to as the Nelson Mass. Haydn's original title was probably Missa in Augustiis, Mass in Distressful Times. The work includes a rather curious and ominous fanfare sequence leading from the Benedictus to the Osanna, but the final Agnus Dei concludes the work a joyful manner. The original scoring was for strings, trumpets, timpani and organ, but woodwind parts were added later in place of the organ. At Hatfield they only had a chamber organ so the woodwind was included as well. Haydn interleaves his chorus and soloists, so that rather than writing discrete arias he gives them solo moments which grow out of the chorus writing. For a lot of the time he uses the four soloists like a semi-chorus. But the solo soprano part his highly florid, and Ruby Hughes brought a lovely combination of fluency and richness of tone to the performance. Haydn's many florid lines were sung with poise and expressiveness, and a lovely degree of character. The other soloist who got the spotlight was bass-baritone Tristan Hambelton who impressed with his firmly focussed voice and beautiful sense of phrasing. Mezzo-soprano Claire Barnett Jones had one or two moments of glory, and showed off a lovely firm and even mezzo-soprano voice along with a nice sense of character. Tenor Gwilym Bowen rather got the short straw, he has a lovely lyric tenor voice and I do hope to hear more of him. The Hertfordshire Chorus provided a vibrantly vivid contribution, singing with firm tone and crisp attack. The acoustic in the Old Palace at Hatfield House is not especially resonant and is better for chamber music than a large chorus. But though the chorus had to work hard, they brought a lively joie de vivre to the whole performance, displaying commitment, enthusiasm and not a little finesse. Perhaps the results were a little too loud in the context of the acoustic, but it was a thrilling and stirring performance. Nicholas Daniel kept his varied performers firmly on track and encouraged them to give us a lively, crisply articulated but expressive and never driven performance of Haydn's mass, bringing the festival to a fine conclusion.